and The Katherine Mansfield Society. The brief from Wellington Sculpture Trust required the sculpture celebrate the life and literary heritage of Katherine Mansfield. I decided to make an exception to my 30 year sculpture practice and proposed a figurative Artwork, a powerful warrior figure, wrapped in a close fitting garment of quotations. Woman of Words is entirely created from words and phrases selected from Katherine Mansfield's short stories, diaries and journals to present information about the writer, the woman and her New Zealand childhood. 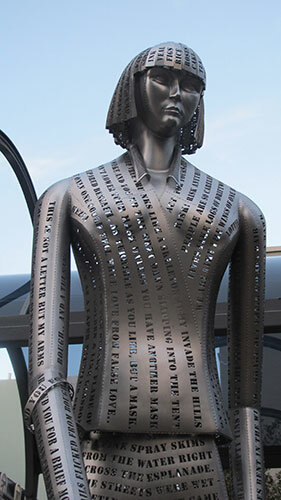 A major challenge was to create soft curving folds of fabric from stainless steel sheet, with lines of laser cut quotations arranged by content to accentuate the shape and movement of the sculpture, enhance the form and allude to contours of the land of which Katherine Mansfield wrote extensively. 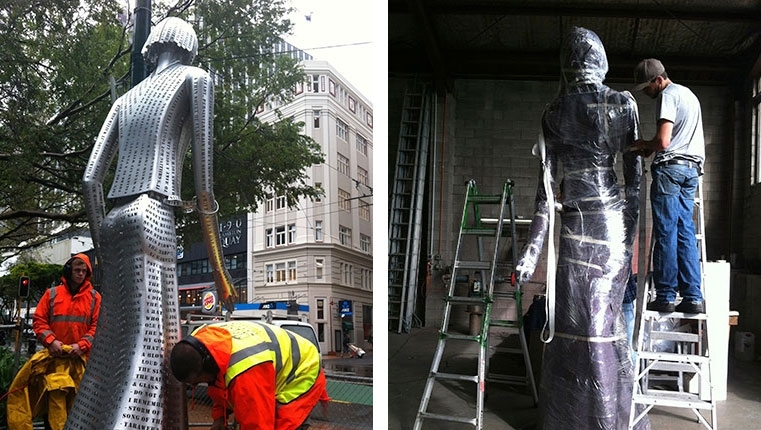 The sculpture is positioned head turned and looking back along Lambton Quay, the former shoreline of Wellington's Harbour, referring to Mansfield's intense reflection on past events. The right arm outstretched to offer lines of words including 'this is not a letter but my arms about you for a brief moment; the sleeve lengths refers to 'The Dressmaker' and the wish expressed for 'romantic rather long, pointed sleeves'. Mansfield's bobbed hairstyle is created from narrow laser cut shopping lists found in her 1922 journal. When I carved the Plaster of Paris hands for the Woman of Words Sculpture, I thought about Katherine Mansfield’s connection with music and the exotic. Initially I had met and stayed with Jon and Judy Craig in Wellington where I photographed Judy Craig’s beautiful musician’s hands. Judy passed before I had completed carving the hands for the sculpture. The second pair of exotic hands belonged to Omarah Hafeez, whom I’d met by chance. Happily Omarah agreed to having her hands photographed for this artwork. Nathalia Lusardi from Argentina modelled for the mask/face of Woman of Words. The sculpture becomes a lantern of words at night; lit from within the words read in silhouette. Dimensions: Height 3400mm x Width 1200mm. Materials: 2.5mm Marine Grade 316 Stainless Steel. Hands and Mask were cast (using recycled 316 stainless steel drop-outs).